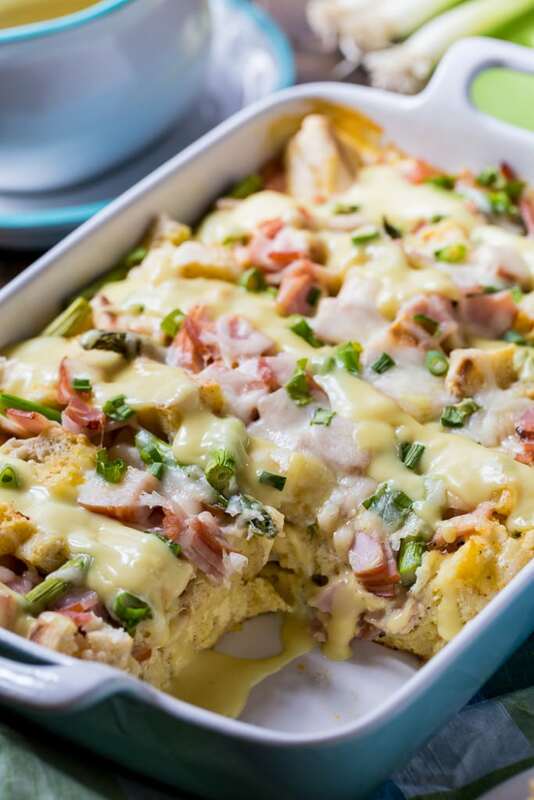 Eggs Benedict Casserole is an easy to make savory bread pudding with all the flavor of Eggs Benedict. Who doesn’t love Eggs Benedict? It always feels like a treat to order it at a restaurant and I occasionally make it at home. 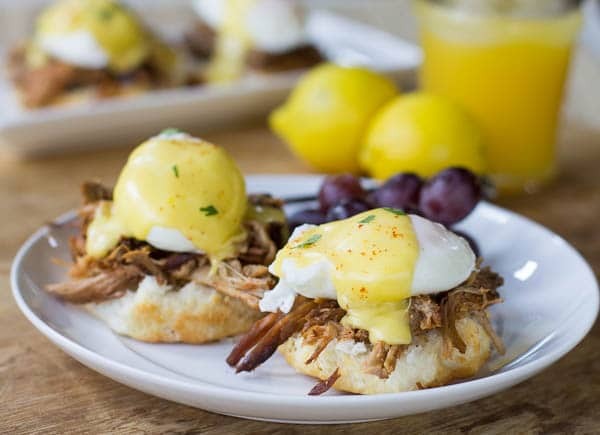 I especially like this Southern Eggs Benedict recipe with pulled pork. But making all the different components and assembling them can be tedious, especially cooking the poached eggs. Well, good news. 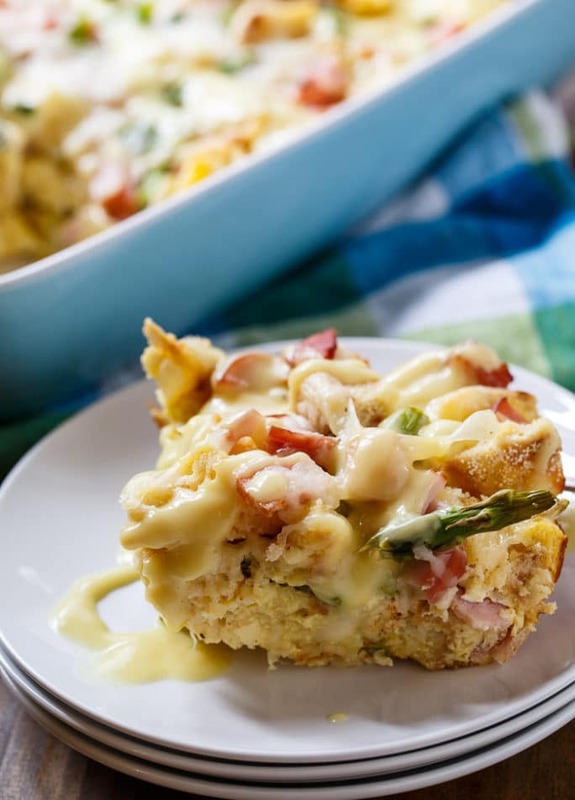 For this Eggs Benedict Casserole, there’s no need to poach eggs or pre-cook them in any way. They get whisked together with milk and poured over the casserole and they cook as the casserole bakes in the oven. And yet, I swear this casserole still has that poached egg flavor. English muffins are cut into pieces and layered with lots of chopped Canadian bacon and asparagus. You can leave the asparagus out, but I love any chance I can get to eat asparagus with Hollandaise sauce. I’ve used Hollandaise sauce made from packets to pour over the casserole, but if you want to go to the trouble of making homemade, it will taste even better. The whole casserole gets assembled the night before, refrigerated overnight, and then baked in the morning. Perfect for a holiday brunch or a special weekend breakfast when you have guests over. 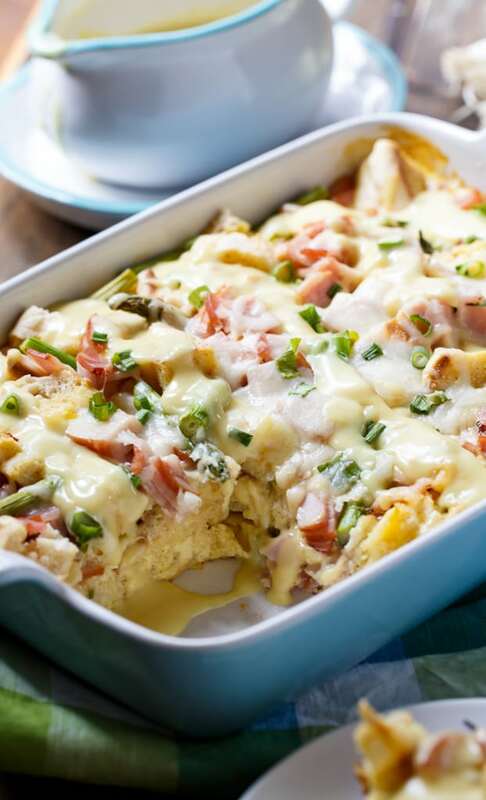 With Eggs Benedict Casserole you have all the flavor of Eggs Benedict without slaving over the stove all morning. Just pop it in the oven, drown it in Hollandaise sauce and let everyone help themselves. Leftovers reheat well too. 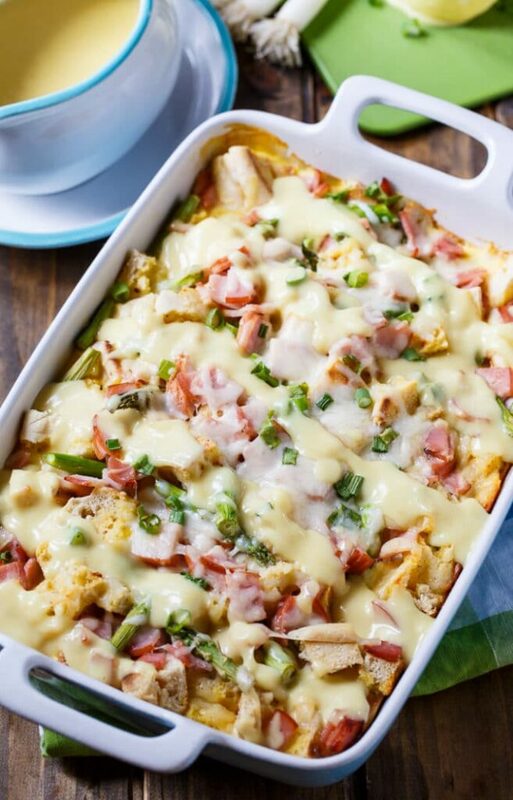 Eggs Benedict Casserole has all the components of Eggs Benedict in casserole form. Great for feeding a crowd. Spread half of English muffin cubes in bottom of baking dish. Sprinkle half of Canadian bacon and half of asparagus on top of English Muffin cubes. Scatter swiss cheese pieces on top of asparagus and Canadian bacon. Repeat with remaining English muffin cubes, Canadian bacon, and asparagus. In a medium bowl whisk eggs, milk, salt, pepper, onion powder, and paprika together. Pour evenly over casserole dish. Cover and refrigerate overnight. Uncover, sprinkle mozzarella cheese and green onions on top and bake uncovered for 10 minutes. Unless your asparagus is very thin, you will want to cook it until just barely crisp-tender before adding it to the casserole. This entry was posted in Breakfast, Casseroles and tagged eggs, eggs benedict. Bookmark the permalink. Will this still work my husband hates any kind of cheese if I leave out the cheese for him? BEST BREAKFAST EVER!! Made this for a family brunch and everyone LOVED it!! Make the Hollindaise from scratch too…. I can’t wait to make this again! This takes much longer than the times specified. It has been cooking for an hour still not approaching being done. Similar recipes are cooked at 375 perhaps that will be better. If Possible, replace chicken eggs with duck eggs… Makes a fluffier better tasting casserole. I made this for my gang of ladies at the beach this morning. We all agreed that it was the best breakfast casserole we’ve ever had! Followed directions exactly. Will definitely make again. Everyone just left from our baptism brunch. Just had to report that everyone said this recipe was “amazing!” It turned out delish! I made it yesterday and put it in the oven while we went to church and it was done when we returned. Thank you! So glad everyone enjoyed it Louise! DELICIOUS!!! I made this for a Thanksgiving weekend getaway with friends. I made two mistakes that ended up not being mistakes at all! First, I never read the instructions fully before I started to make it so I didn’t realize it was supposed to be made and refrigerated overnight! Oops! Then, I misread that the first 40 minutes was supposed to be baked covered. Again, Oops! Well, it turned out delicious nonetheless. Actually, we all agreed that if I had refrigerated it, the English muffins may have been too mushy. Then secondly, by not covering it, the muffins and some of the bacon got a little crispy. Everyone loved it and had seconds! (6 adults) So, to each their own, but when I make this again, and I will, I am repeating my “mistakes”! Lol. Great recipe. Side note…. I think one package of sauce would be plenty unless people really love it. We had half our sauce left. Looks great! But does the asparagus get soggy if I make it the night before? It shouldn’t if you don’t overcook it. 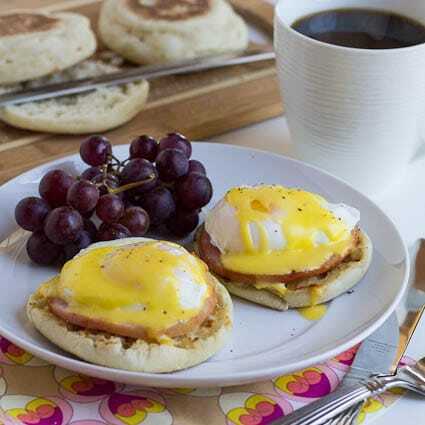 Love this easy way to enjoy eggs benedict! This casserole looks just irresistible! Now this is my kind of breakfast! I love make-ahead dishes that are so full of flavor. 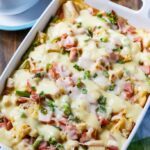 And eggs benedict happens to be a favorite of mine, so I know I would devour this casserole in no time! What a great looking casserole!! We do brunch every Sunday in my house. I am adding this to the menu next week. And I love your pretty dish!! I can’t wait to make this for weekend guest. 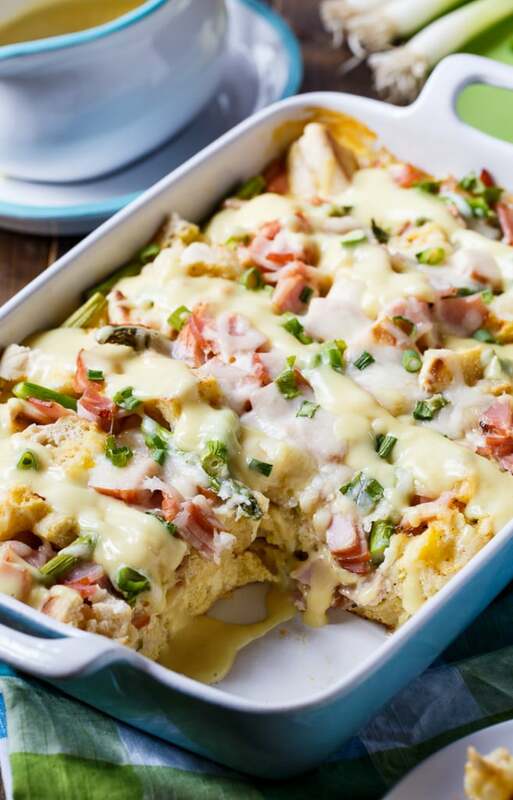 Breakfast casseroles….mmm!